Busch Wiz Kids played seven games on the final day of the tournament, including the two final games, but just could not overcome the talented Cannan’s Illusions squad of Houston. Cannan’s won the championship game 7-3. Kathy Riley’s 2-run triple and Bev Lovett’s single gave Cannan’s three runs in the fifth inning to pull away from a close game. each hit one. For the East; Mike Macenko hit 2 and Jon Kramer, Ron Murphy, Kevin Fleming, Ted Cox, Mark Martin and Bruce Meade all hit one. Bronze Medal Game – North defeated South 19-18. Doug Berfeldt crushed a HR in the bottom of the 7th to give the North a 19-18 victory over the south. The game featured 11 HRs, three by Berfeldt. Doug Johnson hot a HR for the North. For the South; Rich Plante, Andy Sanzaro, Dave Steffen and Greg Fuhrman all hit homers. 178 Home Runs were hit during the tournament during the 14 festival games, including the Medal Round. out on top giving up 100 runs versus North’s 110. Runner Up – Armed Services, Washington, D.C.
1998 held at City Park, in Burlington, North Carolina on September 3-4. Ritch’s Salvage of Harrisburg, NC, won three straight games to capture the ASA Men’s Major Slow Pitch National Championship at City Park on September, 4. Superior-Apollo of Windsor Locks, CT, had beaten Ritch’s the night before in the finals of the winner’s bracket, 18-13. Ritch’s then met Starpath/Kirk’s Glass of Monticello, KY, in the loser’s bracket finals and defeated them, 15-11. In the first game between Ritch’s and Superior-Apollo, Superior-Apollo failed to nail down the title, for Ritch’s foiled unbeaten Superior with a 20-8 win. The Ritch’s victory sent the two teams into a final showdown. Superior-Apollo scored five times in the first inning, but Ritch’s came back with two runs in the bottom of the inning. After Superior-Apollo added three in the second, Ritch’s cracked out 10 hits for 11 runs in the second for a 13-8 advantage. 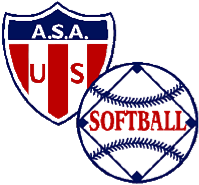 The hard hitting continued for both teams and Superior-Apollo roared back with 11 runs in the sixth and four in the seventh to tie the game at 24-24. Ritch’s needed just one run to win in the bottom of the seventh. The first batter, Mike Nye, reached on a single, and shortstop Greg Whitlock ended the game with a two-run homer to give Ritch’s the title. The championship game was not even close as Superior/Apollo defeated Ken Michael’s/Fanny & Parr 65-16. Ken Michaels, in high spirits after knocking off powerful Steele’s 32-20. Steele’s was sent to the loser’s bracket by Superior/Apollo in the winner’s bracket final 32-31. In the Championship game, Dave Steffen set a record by hitting 9 Home Runs in the game. Steffen was 9 for 9 with 9 HRs and 13 RBIs. MVP Clyde Guy was 8-9 with 5 HRs. Rick Scherr (7-9, 6 HRs), Doug Roberson (8-8, 3 HRs), Rich Plante (8-8, 6 HRs, 11 RBIs), Darrell Beeler (7-8, 3 HRs) and winning Pitcher Greg Fuhrman 4-7 with 4 HRs) led the offensive explosion. In the game where Ken Michaels eliminated Steele’s, Rick Wheeler and Ted Cox both had 4 home runs and combined for 14 RBIs. Mike Macenko was 4-4 for Steele’s in the loss. Bell Corp went 4-0 in this tournament Ritch’s won won their first two games before losing to Steele’s. Ritch’s had to come back through the losers bracket defeating Lighthouse, New Construction and getting revenge on Steele’s by eliminating them also by a 17-15 score. Ritch’s hit more HRs than Steele’s did as well. . Ritch’s defeated Bell in the first final 11-7, but then came back to win the title 14-6 as John Beasley hit a 3-Run homer to get them back in the game after Britt Hightower’s homer gave Ritch’s an initial 5-0 lead. Mark Heirlmeier had 3 hits and a HR for Bell in the game. Danny Williams also had 3 hits for Bell.